Joan Sowada creates contemporary artwork using the comforting and versatile medium of fabric. Most of her abstract conceptual pieces are sewn by hand and explore concepts related to seasons and wishful healing (mending). 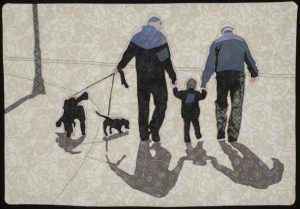 The figurative artwork is more often accomplished using fusing and machine applique and quilting. Sowada uses a wide range of fabrics – recycled clothing, commercial cotton, and fabrics she has altered with paint and markers.